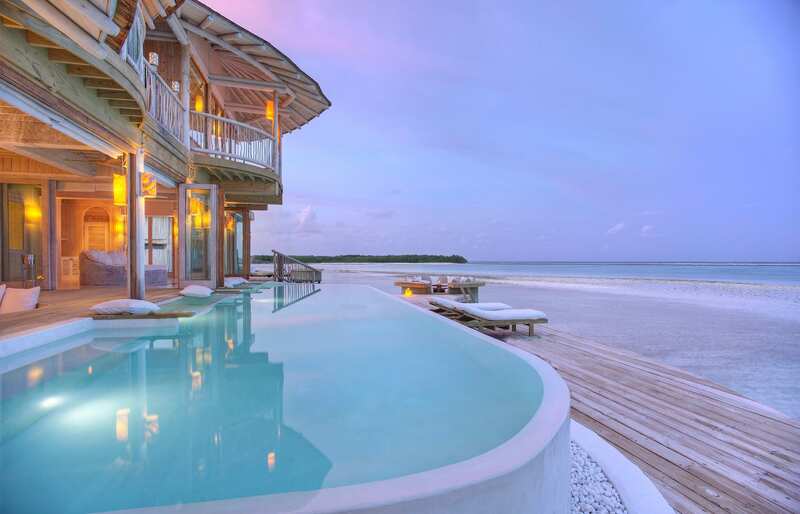 It took over twenty years of setting the barefoot luxury trends for Soneva to re-focus on the Maldives. In their latest project, the philosophy and the aesthetics of the brand come together in shaping Jani to be close to a perfect escapist resort. 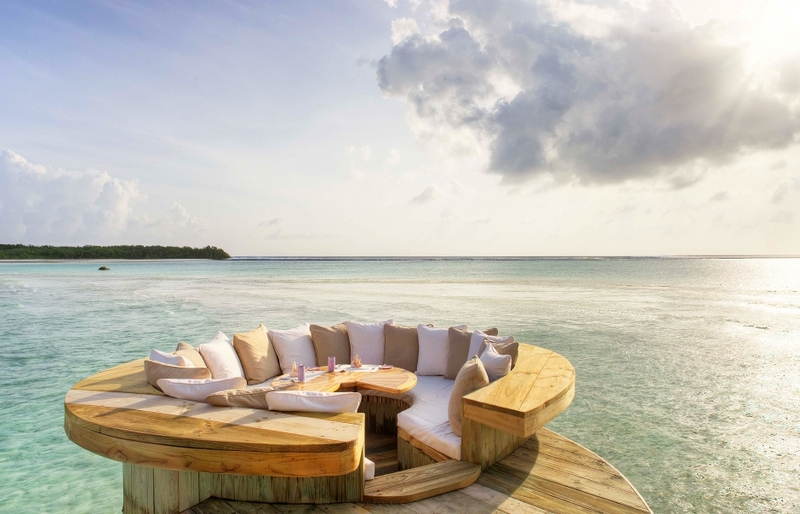 As soon as we learned that Soneva was planning to launch a new property in the Maldives, we knew it was going to make it to the top of our bucket list — because we never forgot the amazing experience of the Soneva Kiri resort. There are only three Sonevas (plus a luxury yacht), so it’s an austere portfolio, but the owners of the mini-chain, Sonu and Eva Shivdasani, have experience of setting the barefoot luxury benchmarks for decades. The wisdom acquired in these years shaped their latest project as much as the principles of the brand. 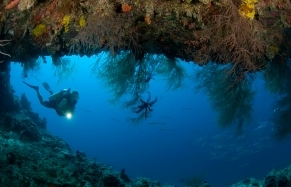 It also inspired the confidence in believing that the Jani will become the most desirable Maldives destination. So far this confidence does not appear to have been misplaced. 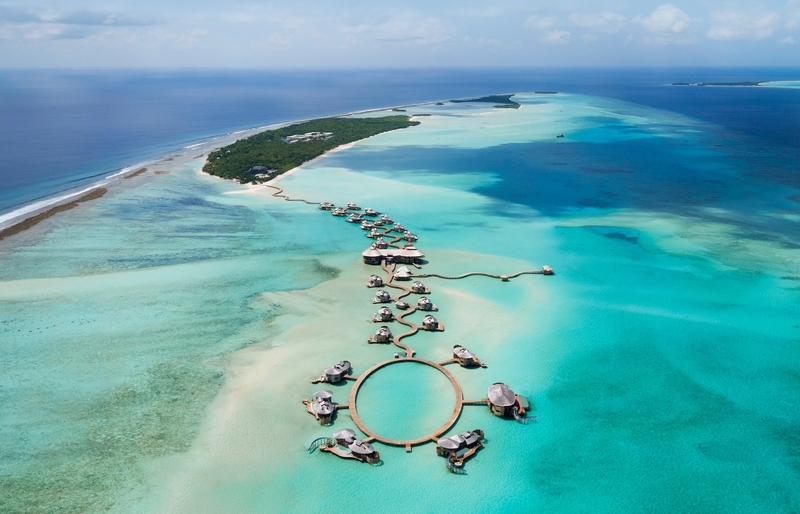 We love the Soneva properties (we visited all three), each for different reasons, but right now Soneva Jani steals the limelight — and there are plenty of good reasons for that. First reason, of course, is the almost fairy-tale architecture of the resort, coupled with the sublime interiors. Both draw something from the sensation of a sunny, tranquil day, both inviting to experience an endless summer. The Jani design taps into the archetype of the perfect vacation, imprinted in memory as the afterglow of a brilliant sun and the smell of an ocean breeze. As the raised pathways snake away from the main island into the perfectly blue, shallow lagoon, the silhouettes of pitched roofs shimmer in the sun, almost weightless, almost a mirage. But they are real. 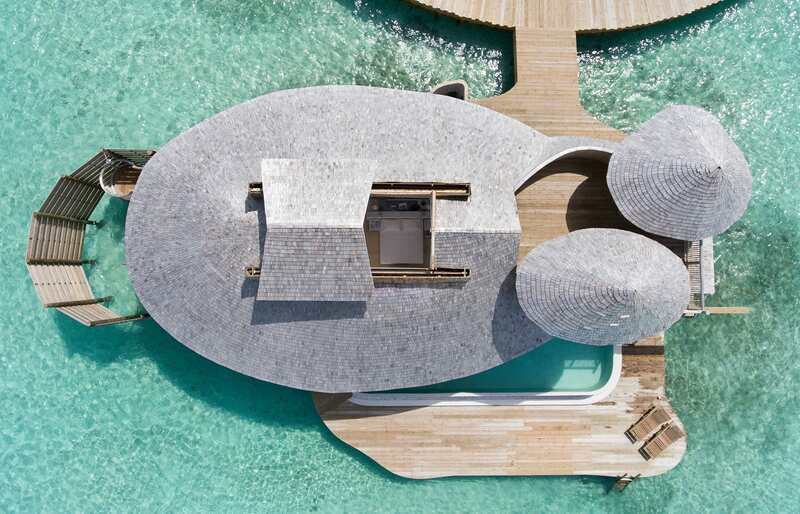 The overwater villas are the absolute highlight of the Soneva Jani experience. 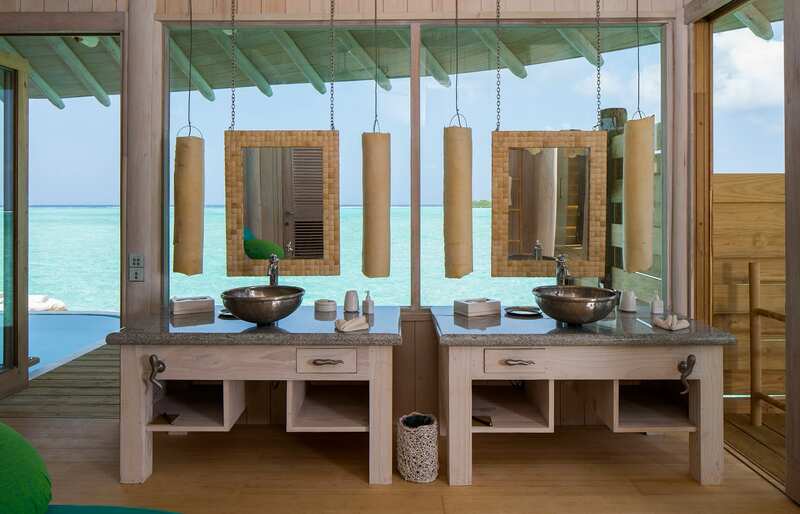 Their creators put a strong emphasis on the things that make Soneva so loved by its repeat guests. 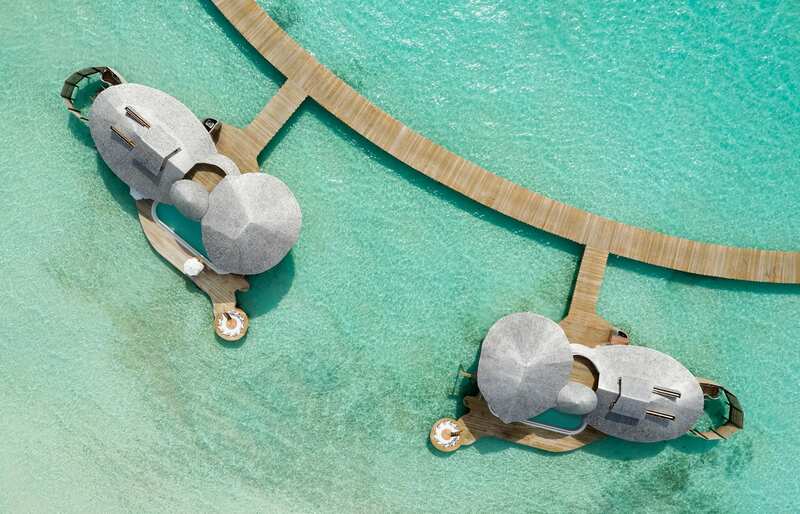 It begins with the first essential luxury: starting at 400sq (the largest entry-level villas in the Maldives), the amount of private space here is extraordinary. Open-plan and airy, each room in the villa naturally flows into one another, from the outdoor bathroom on one side, through the bedroom, kitchenette, lounge areas and out to the oversized pool and various terraces. The interiors are in a perfect balance between the sleek, comfortable luxury and a kind of beach-flotsam-inspired vibe. Some of it is achieved by the precise craftsmanship, but most of the work is carried by the stylistic choices. The wood is only subtly blanched and fashioned into simple furniture with plenty of elegant curves. The supplementary palette of pastel greens and purples works here incredibly well, complimenting the silvery white and lilac. The colours fit the resort themes, matching the light that fills the rooms. 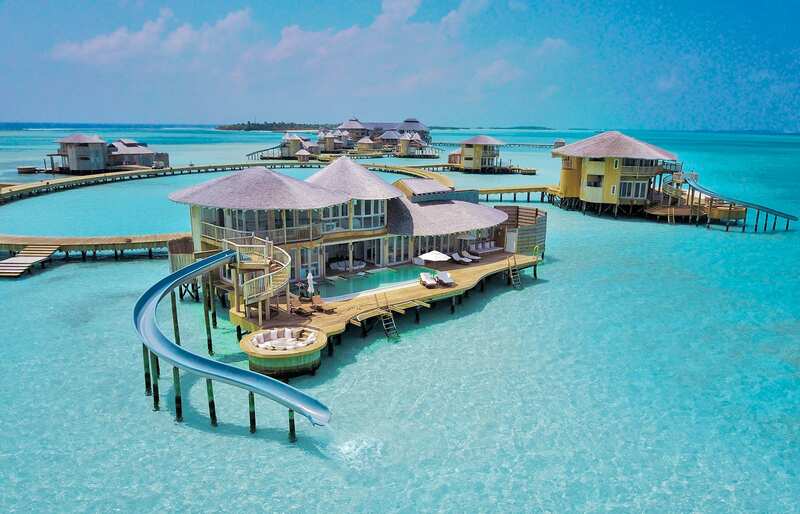 Then there is the delightful playfulness, as in the vintage suitcases that hide the flat screen tv, or the water slides that go directly to the lagoon (in most of the villas). Our favourite thing in the bedroom was the movable roof above the bed. It’s a cool, romantic idea. Where else you’ll enjoy a true night under the stars, yet fully indoors? At Jani, the perennial airiness becomes a feature in itself. It’s the standout characteristic of the main building, where the restaurant, the shop, the spa and other facilities are housed. The bar and dining spaces are strung on multiple levels around the huge cavity of the lounge. Organically-shaped and harmonious with the surroundings, this is the place most in tune with the whitewashed beach-side-hangout style the resort’s designers looked to as one of the inspirations. This works pretty in proportion to the amount of roaming space outside. 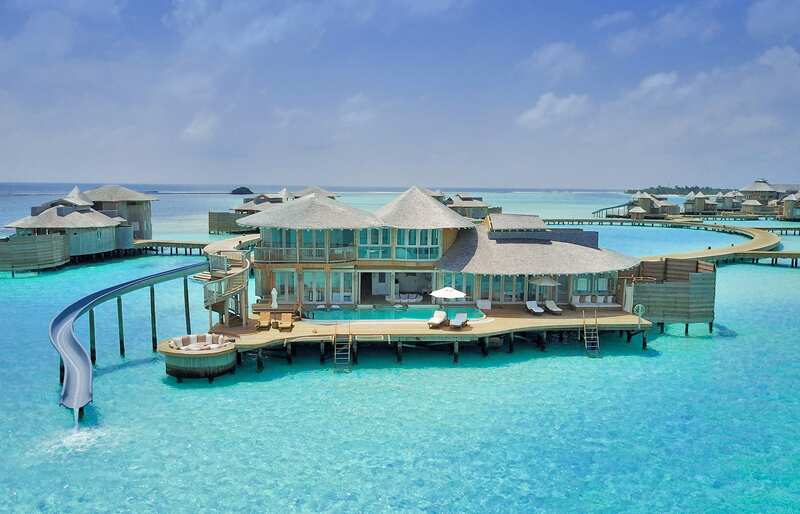 The resort, set on stilts in blue shallows, is anchored off Medhufaru, one of the largest islands in the Maldives. 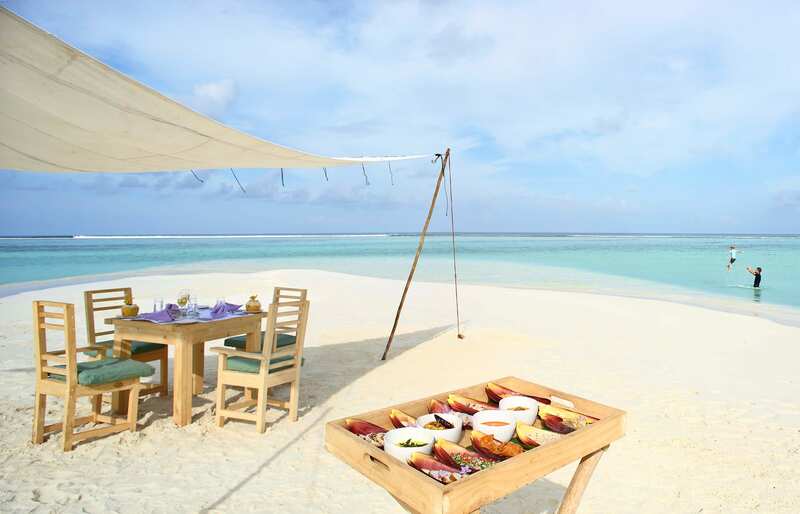 But Jani occupies an entire archipelago, as Soneva has exclusive rights to use four other deserted islets. The couples will fall in love with the long beaches, the privacy of the villas, and the Cinema Paradiso, tucked away on the other side of the main island. Children small and big will love the fun slides. But absolutely everybody will appreciate the exclusivity and the privacy of the resort, its indulgent luxury and the service that comes with it. Take all of this together and you’ll understand how that accumulated-over-the-years experience of the Soneva creators cumulated in a place that’s truly unique. And it’s all in the name, too. “Jani”, in Sanskrit, means “Wisdom”. 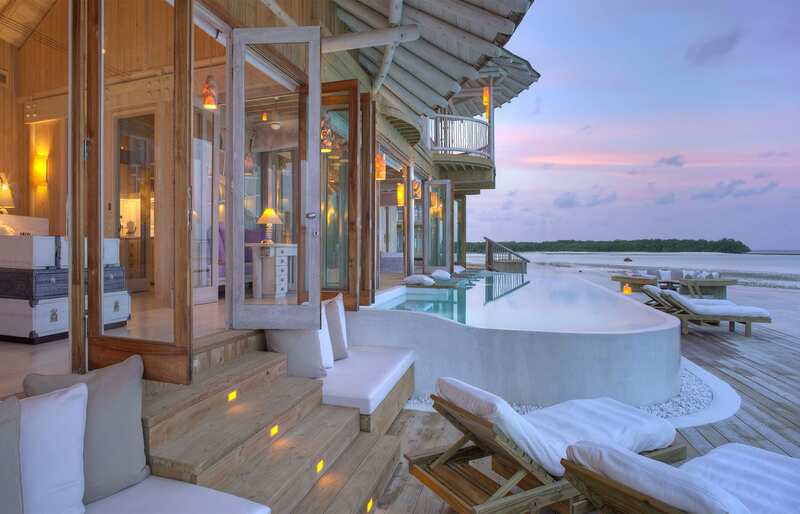 To everyone who can afford it, Soneva Jani will serve the barefoot luxury at its most dreamy. The resort's ethereal design, seamless service and the incredible beauty of the lagoon all contribute to making every day here perfect. 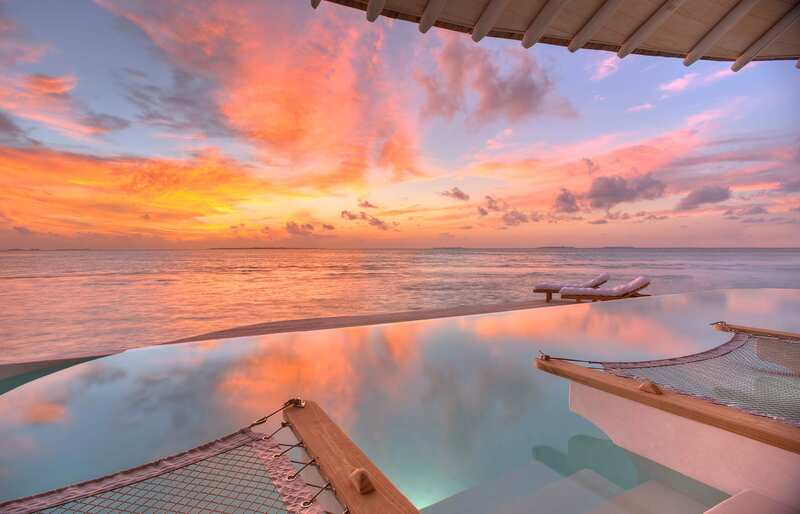 The Soneva Jani is certainly among our favourite resorts in the Maldives — and the Editor's Pick is well-deserved. Wonderful design, in and out. This truly deserves repeating. The resort tuned-in to the location and the idea of the beach holiday, all the while preserving its own brand style. 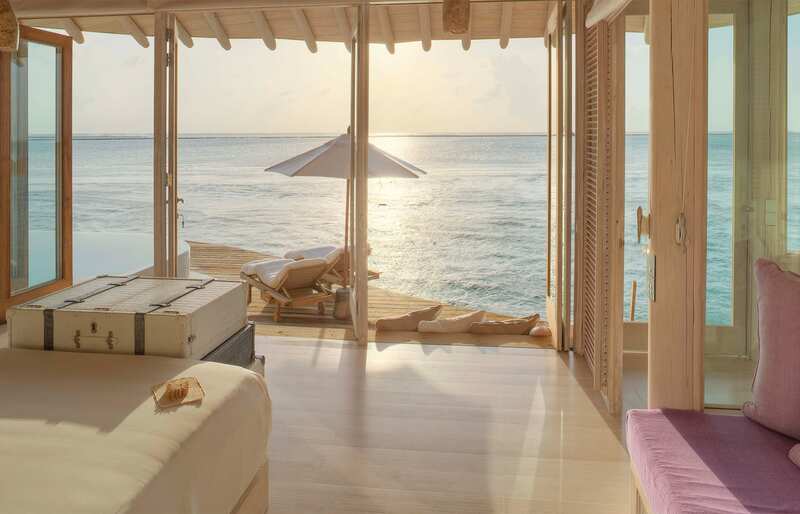 The kind of luxury beach chic created by Soneva Jani is pure perfection. Our villa, even though it was just the entry-level, was absolutely huge, with plenty of space to read, play, eat, swim, chill, sleep and do whatever. We had the fantastic swimming pool, several sundecks, shaded roof terrace. 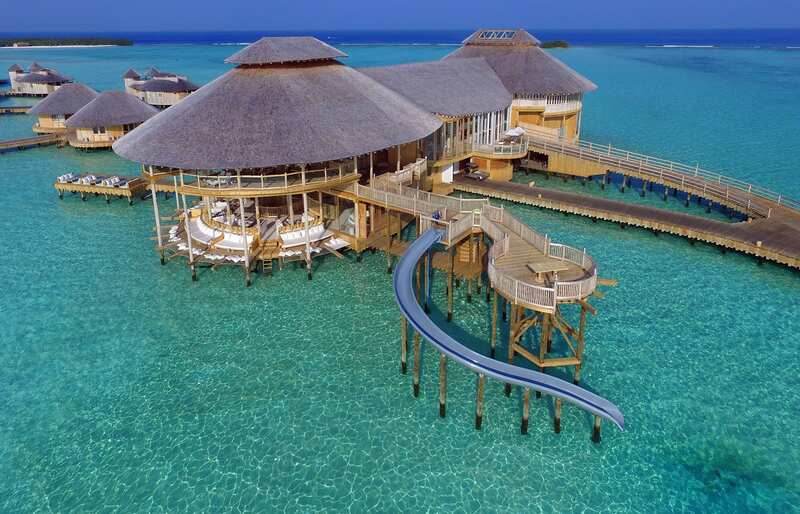 Most villas also have its own water slide (though ours didn't, oh the heartbreak!). What we did have was the sliding roof above our bed. Press a button, and the roof slides back, turning the bed into a sunbed by day, or into a starbed at night. The romance! 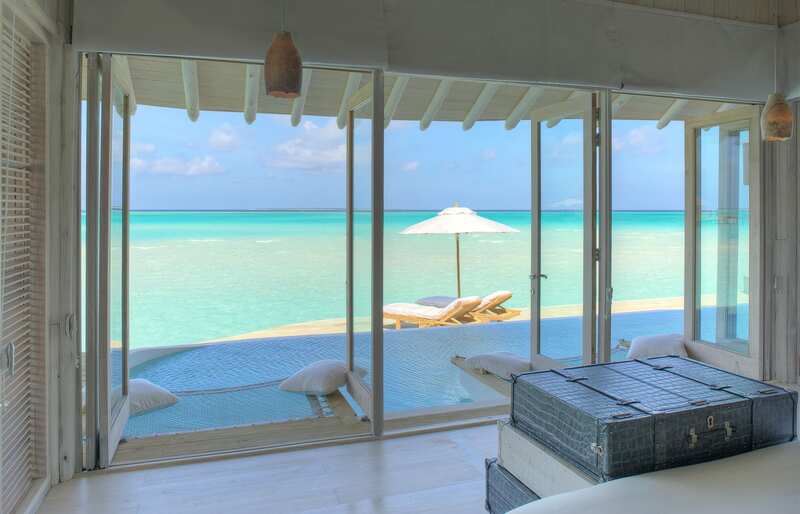 The resort is surrounded by absolutely vast shallows of crystal clear waters with impossibly blue water. It's one of the largest lagoons in the Maldives. 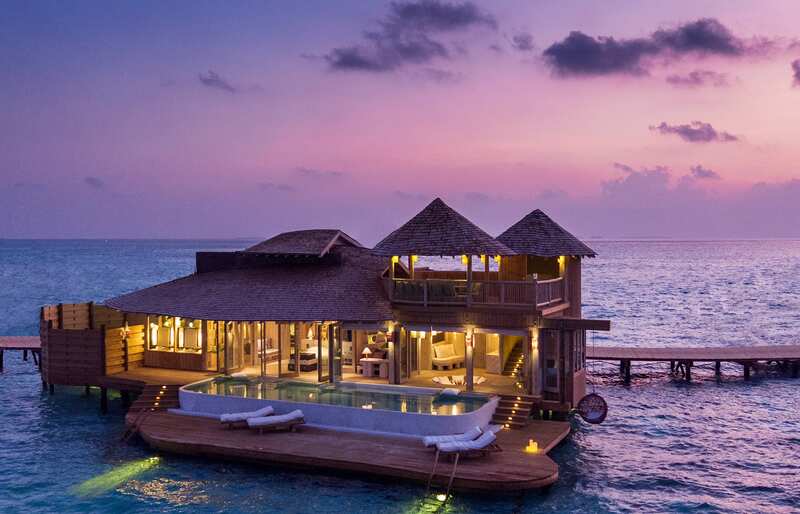 Unlike any other resort in the Maldives, Jani offers access to five islands. 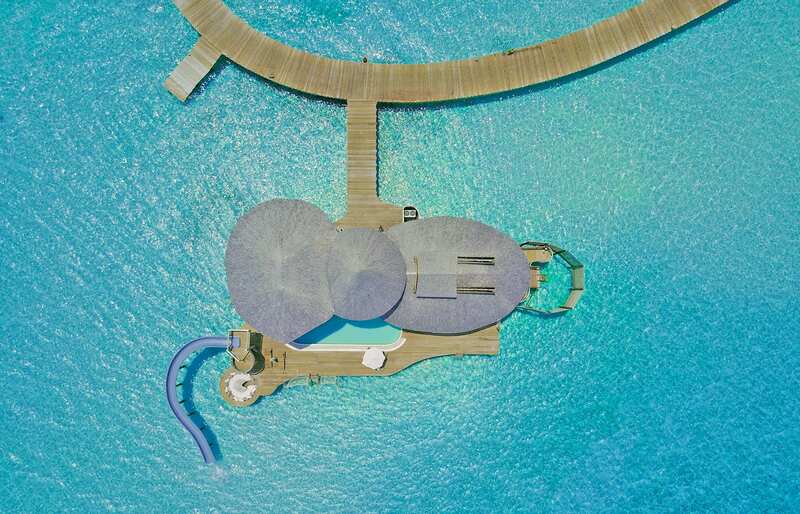 The main island, Medhufaru, is occupied by the resort, with plantations, gardens, and sports facilities located here, as well as vast beaches. But there are also four other islets, all deserted (though one of them, Zuhairs Island, has a tented seafood restaurant and a beach club). Nevertheless, Jani offers the best chance at imagining yourself to be a castaway. The service is one of the highlights of Jani. Every guest gets their own private butler (called Mr or Ms Friday), who will attend to your every whim, no matter how silly… without dropping the perfectly composed, friendly attitude. 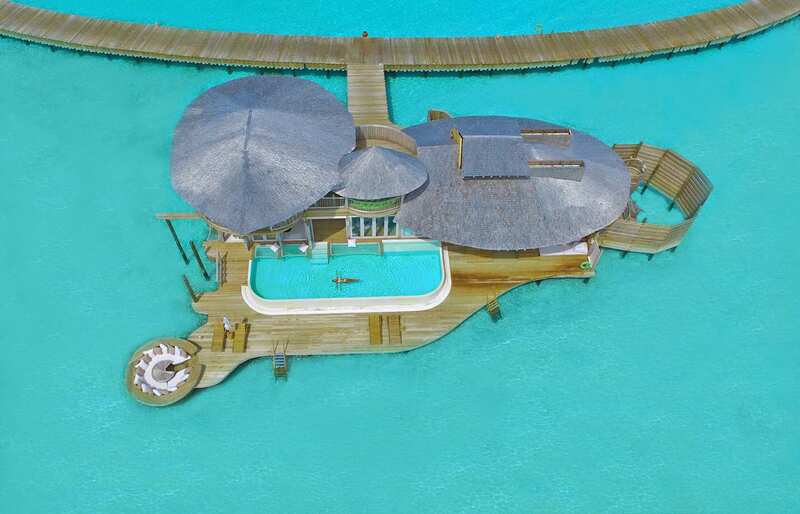 The resort has the largest telescope in the Maldives, and the observatory (the first one to be located overwater) is simultaneously a dining platform. 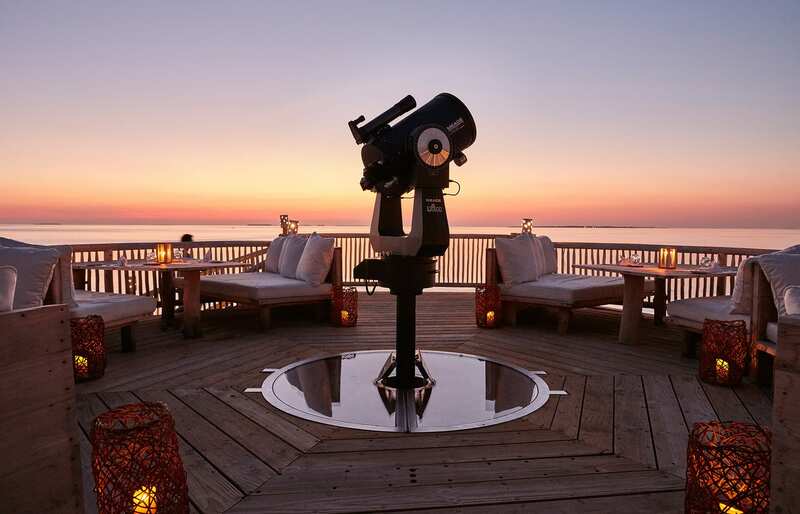 The resident astronomer will be happy to zoom in on the Ganymedes and the Callistos of the skies, and guests can follow on screens connected to the telescope. 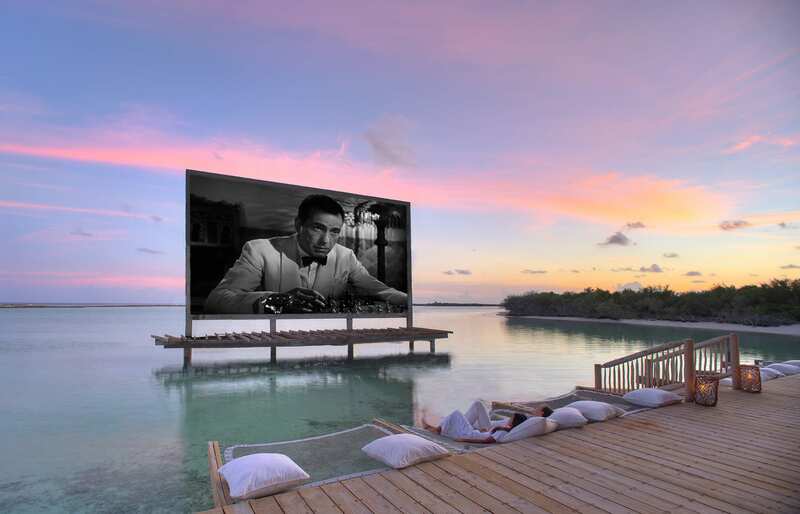 From among the Soneva resorts, the open-air Cinema Paradiso at Jani is probably the best-looking. 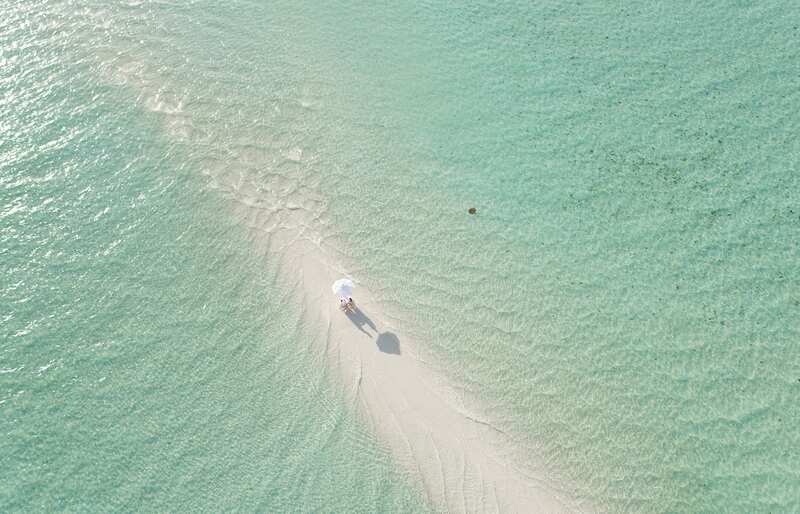 It's located in a remote spot, over water, with its own bar — and the cinema-goers are given Bluetooth headphones to limit any disturbance to the turtles nesting on the island. 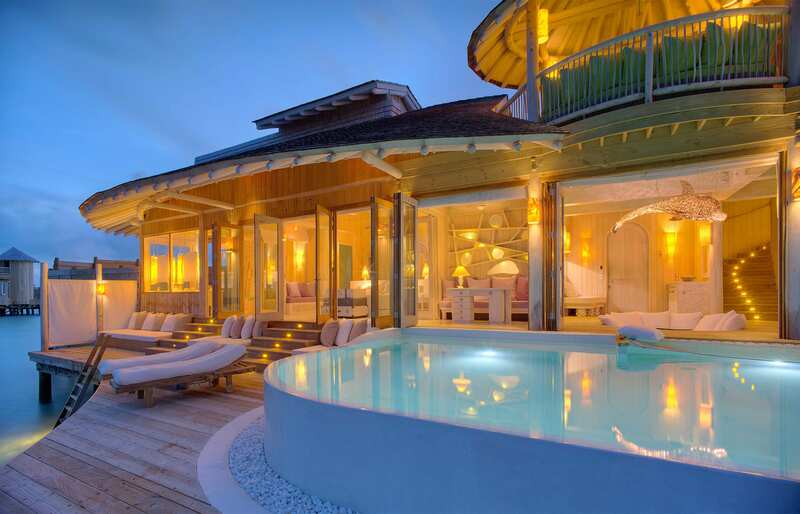 Which is very commendable, and synced with the eco attitude of the Soneva brand. All guests are provided with bicycles (or tricycles) and they are super fun, especially on the walkways-on-stilts that lead from the island and snake between the villas. There is not a single portion of it that's exactly straight. They weave and meander and curl and it just puts us right in the right mood. The No News No Shoes policy. They will “confiscate” your shoes on arrival. 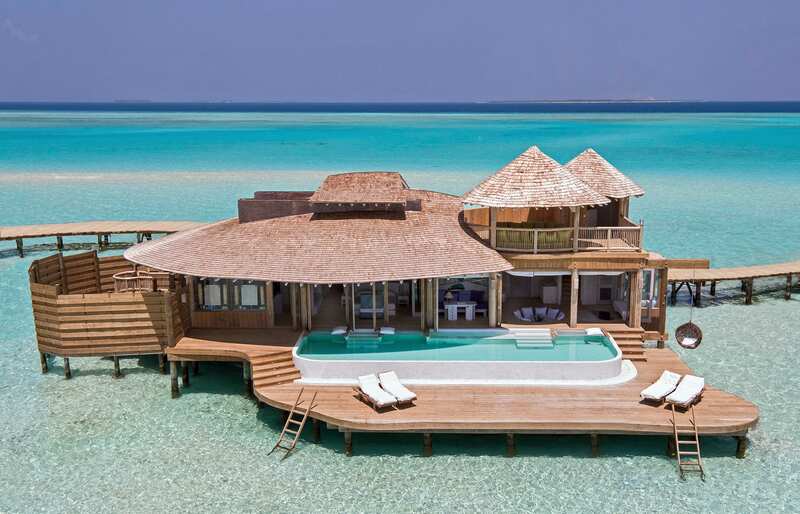 It's the same idea as in the other Soneva resorts. Enough to say that between Fushi and Jani we wore no shoes whatsoever for two weeks. The resort has its own chocolate & ice cream parlour, open from noon until late. It's free! The overwater nets of the main bar at the resort are simply perfect spot for the sundowners. Cheers! 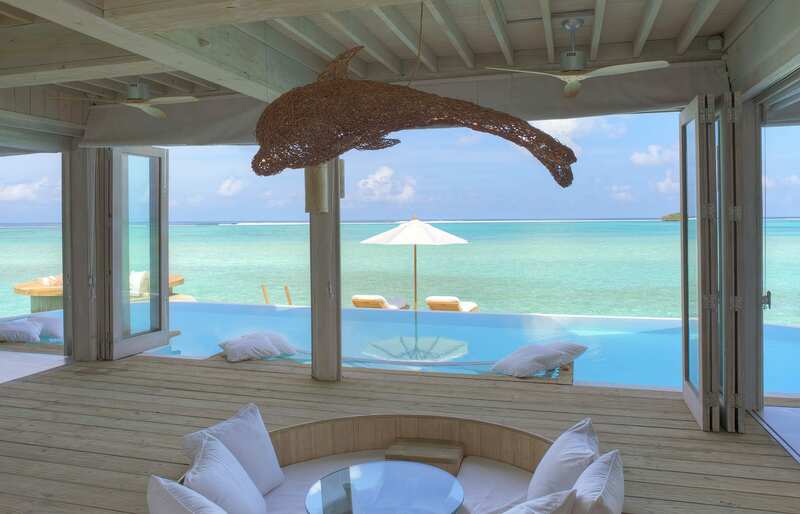 At the time of our visit, Soneva Jani was through with the first phase of its creation. 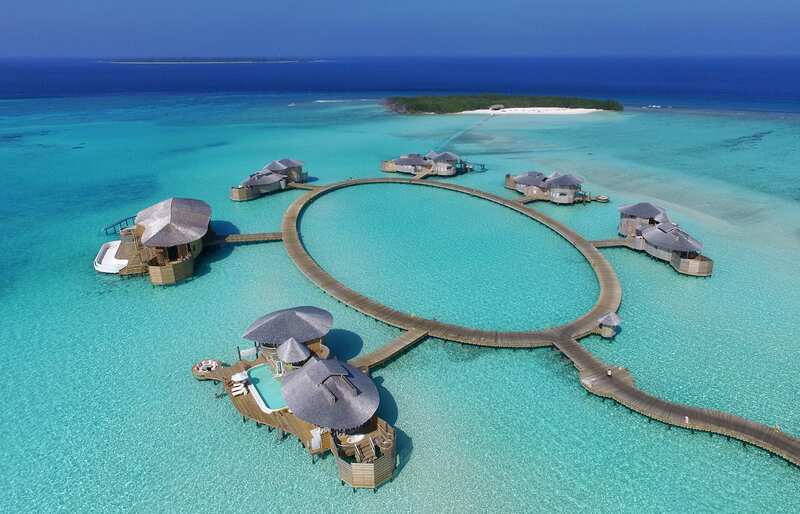 All the water villas were ready, as were the core facilities. However there was only one beach villa ready (a multi-bedroom, sprawling estate), and the kids club called the Den, on which Soneva always puts much emphasis, was not ready yet. All of this will be fixed in the second phase. The super-cool idea of the movable roof is super-cool until it isn't. It works great, and it is wonderful with a clear sky, but the weather in the Maldives can get rather naughty. We visited in the wet season, and when the bad weather came (overall for a couple of nights only), it got real bad. The hurricane-level winds pressure-pushed the rain inwards, and… well, let us just say the water dropping on you in the middle of the night is not something we expected. The same goes for the main building. Its huge cavity looks fantastic, but when strong winds and rain come, most of the space becomes unusable. "Mr Shivdasani builds his resorts for beautiful weather", we heard unofficially. There is something to it. Do try to book the other Soneva property in the Maldives too, the Soneva Fushi, combining it with Jani (which is what we did). The resorts are some 40 minutes by a speedboat apart. 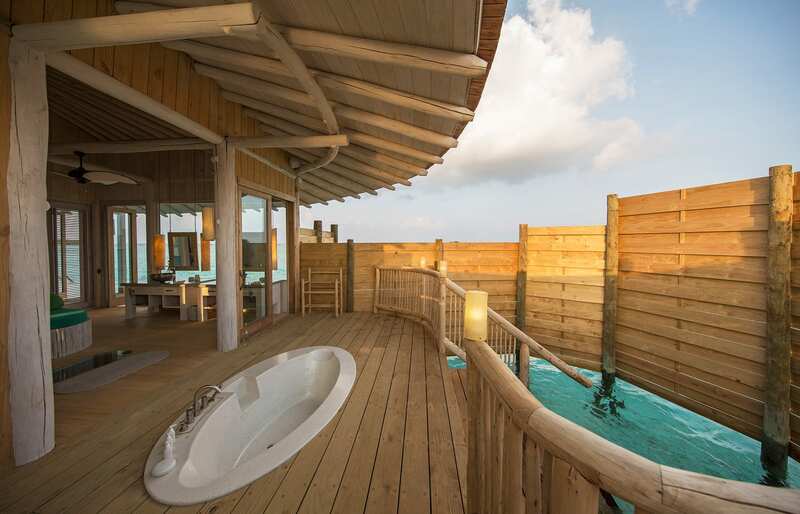 This short ride separates two very different experiences… both of which nevertheless remain thoroughly "Soneva". Check out our review of Fushi, the place that basically invented “castaway chic”. 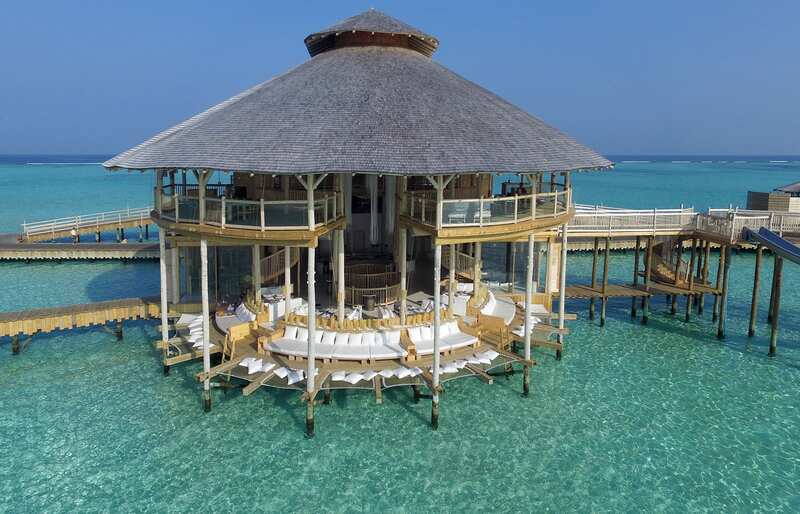 Both resorts share the chefs, but although the food was absolutely fine at Soneva Jani, weirdly it did not wow us as much as at Soneva Fushi. We are not sure what was the secret ingredient at Fushi. It has to be said that some sun decks of the villas are less private than others. 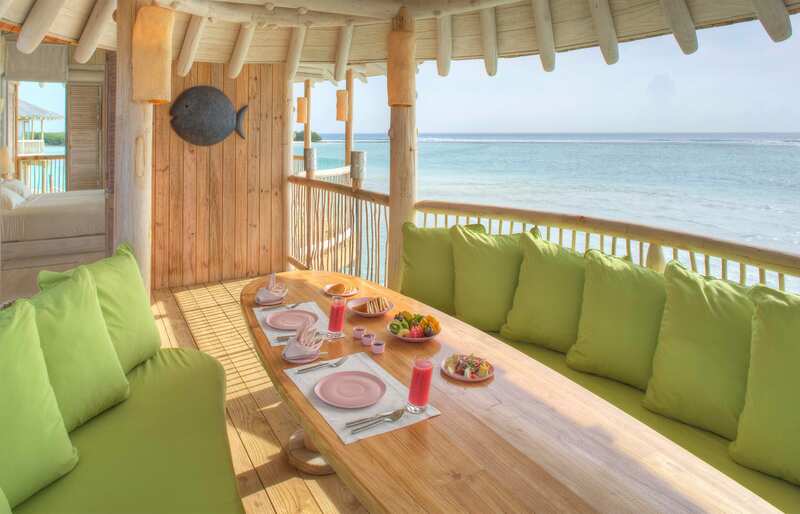 Soneva Jani is located 35 minutes by seaplane from Malé International Airport.